The weather has still been hit or miss. Can’t believe we got snow last week and I hate even writing it but I hear there is a possibility of more for next week. We keep plugging along at the barn trying to get horses ridden regardless of weather. Rockin Fun is still with me in training and is doing great. 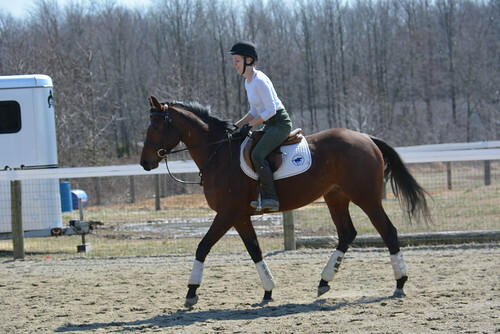 He is a really cool horse and his new owner is going to love him. She had asked me to make her a video of him on a normal day. It had snowed and the ring was a mess so I took a video of us taking a journey down the driveway..walking past scary stuff..dealing with traffic and then..oh boy..we encountered an Amish buggy. I have never been on a horse during a close encounter with a buggy but I think this is about as good as a horse can possibly deal with it. I was more worried than he was but mainly because the horses tend to freak out when they come by just when they are in the field let alone when you are up close and personal. He has such a great brain! 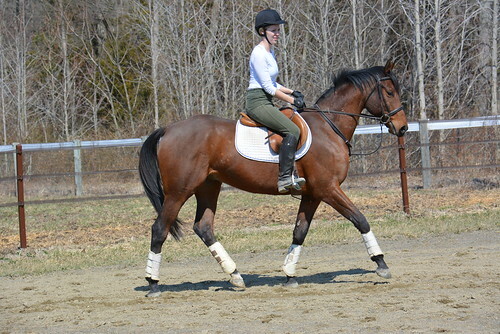 I have friends mare in training for the month and she is learning some good dressage work. She is a cool horse and will be headed to the TB show at Winterplace park the first weekend in April. Elusive Sky and Ridge Amour are both still boarded with me and doing very well. Elusive Sky was a resale horse of mine. Ridge Amour was a CANTER owned horse. I also got a new boarder with an awesome TB that I trained and sold. His name is Necessary and he is a cool TB that ran 50+ races and is more like a dog than a horse. I’m happy to have him back at the farm and his owners are great. I love my boarders and we all have such a good time together. Truckee has just absolutely blossomed. I am saying it here…this horse is very talented. I think he has what it takes to be an upper level event horse. Really really nice horse! 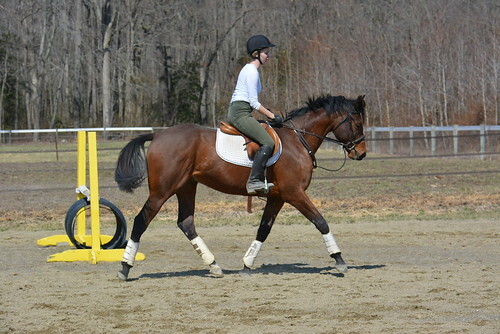 Good mover, good jumper, forward thinking, brave and just smart as can be. He is cheeky without being mean so he won’t fit everybody but those who like a really talented athletic horse will love him. He is so uphill and balanced. 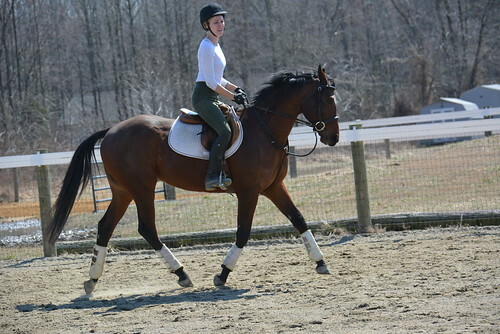 I imagine with consistent riding he is going to be amazing. He jumped the brick wall on his first try last night!!!!!!!!!!! 3rd time jumping. Here are some updated pics of him. I will get even more pics and video this weekend. Half the battle is just getting them clean enough to get the pics and video. We clipped more off of Truckee now so he is looking good! There will be some changes coming for the CANTER horses that are local to me. The amazing farm they are at is getting out of boarding so we are relocating to a farm that is even closer to me. It has a huge roundpen that is wood with tall sides and also a covered riding ring! Since it is only 15 min away I plan on just keeping the horses there and riding them off that farm. Amanda and I are going to work together and we should be able to restart a greater number of horses. We will be starting with four horses (all that are moving from the other farm). That means Yesterdays Story, Stormy Horizon, Money for Love and Davids Little Boy will all get started in work next month. It should help us retrain and rehome a great number of horses. I think that it will all work out so we shall see. I plan on doing one personal resale at a time. I don’t want to get overloaded. I have Rocky and Slippers in for training so possibly next month I will start looking for one to buy. I plan on doing some eventing with Junior. Just lower levels and see how his knee holds up to it but he has always been sound (knocking on wood!). The goal is to get Truckee sold by next month. The weather has to allow us to get consistent but he is ready to be marketed! My divorce is final at the end of this month. That is a chapter that I am looking forward to putting behind me. It’s sad in some ways but there has been so much good that has come out of it that sometimes I look at it like a favor. I have met a certain someone who I have been dating for four months and it gives some perspective on things. I didn’t really intend to get into a relationship so soon but life has a funny way of throwing curveballs at you. New guy doesn’t have horses but he does have a big farm locally that he farms and he enjoys the same type of lifestyle that I do. I have been able to move on relatively easy and just pick right up again. Now I am working to perfect that work to life balance we all struggle with 🙂 I struggle to say no to work but I really do need to slow down. I sold 16 horses last year of my own and 6 CANTER horses on top of my full-time job! That is just crazy!!!!!!!!!!!!!!!!! I find I am less stressed now that I have taken a major step back. I am working to refinance my farm and once that happens I will have a better picture of how I will go forward into the future. For now it is just one step at a time.